Tarkir is a little different than how you may remember it. We started in Khans of Tarkir with a world without dragons. 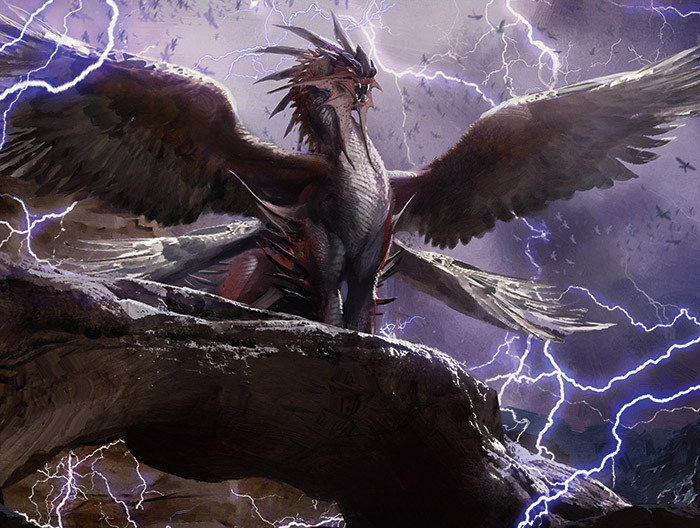 In Fate Reforged, we went back into the past and Sarkhan Vol revived Ugin, causing dragons to reappear on Tarkir. And now here we are. Once again on Tarkir. It's the same plane—and yet so very, very different. Welcome to Dragons of Tarkir. It's time to align with one of five dragons on this new world. Will you fight for Dromoka, Ojutai, Silumgar, Kolaghan, or Atarka? And, of course, the best way to align is the Prerelease! At the Prerelease, you'll have a chance to make your allegiance known and to even become a dragon and burn down some hapless citizens of Tarkir! If that sounds awesome—or you just want some tips on deck building and playing at the Prerelease—read on! Tarkir may be a deadly place—but the Prerelease is one of the best (and safest) ways to go and check it out! Prereleases have always been some of my favorite tournaments. The set is brand new, and the footing is fairly equal as everybody plays with the set for the first time. One of my first tournaments was actually a Prerelease in 2001, when I was just eleven years old—and I had so much fun there that I've always eagerly awaited them ever since! Even now, inside Wizards, fourteen years later, I still eagerly look forward to seeing how the Prerelease unfolds! It's your first chance to play with the new cards before anybody else and get an edge over all your friends. It's even. And most of all, it's a low-key, more casual event that's just a lot of fun! If you're a Sealed Deck veteran, you may want to skip ahead to the next section, where I talk about some of the differences and special pieces you can expect at your local store for Dragons of Tarkir. (Like, for example, how you're going to rain fire down upon some of Tarkir's citizens!) But if you're new to this whole Sealed Deck shindig, or are maybe just looking for a few extra pointers, then read on! Okay. So step one is you actually have to get to one of these "Prerelease" events in the first place. How might you go about that? Well, if you don't already have a local shop you frequent, be sure to check out the store locator to find one near you! That store may even offer preregistration. Prereleases are one of the most popular events we put on, so be sure to check and see if the store preregisters. The best time to find out an event is full is decidedly not when you show up and learn you can't play, so be sure to look ahead. Okay. Great. You've found your store—excellent! Next step! It's dangerous out there in Tarkir, and—whether you're a Planeswalker, a dragon, or merely a one-eyed homunculus wandering around—having the appropriate essentials packed for your travels is crucial! While you will be building your deck for the event with cards you're given when you get there, there's plenty to do beside just that. For example, you may still want to bring a Standard or Commander deck to play between rounds for fun, a trade binder, pen and paper to keep track of life, and even a water bottle plus a few granola bars to snack on. You can expect a Prerelease event to take about four to five hours, so just like in the Lion King—and sing it with me now—beeeeee preparrrreeeeeeeddd! Okay, now that the musical interlude is out of the way, let's see. You have a store and you've packed your trusty bag with all of the essentials to travel into the past. You've watched How to Train Your Dragon four times and have thought through what you're going to name each of the dragons you open. Whether you've been following along for the entirety of Tarkir block or Dragons of Tarkir is your first sojourn into the world, you're going to be starting at the same spot. It is a whole new world, after all! If you're used to thinking about three-color cards because of Khans of Tarkir, you'll want to rinse out your brain a little bit. 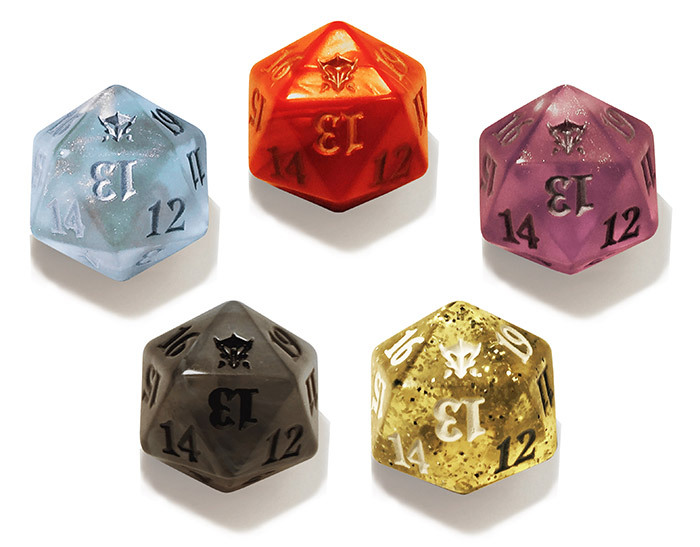 Dragons of Tarkir is a two-color set. Yes, that's right. You'll be aligning yourself with one of five dragonlords, each of which is two colors. We first saw them in Fate Reforged, and they're still here more than a millennium later—and now they have dominance over their respective clans! What are these new clans? What can you expect if you play them? Well, let's take a walk through each of the five! 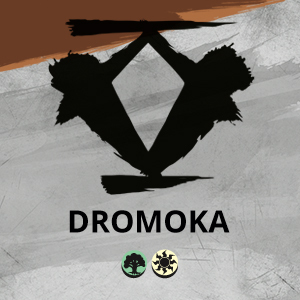 Dromoka likes to build up an army and then slay her enemies with it. 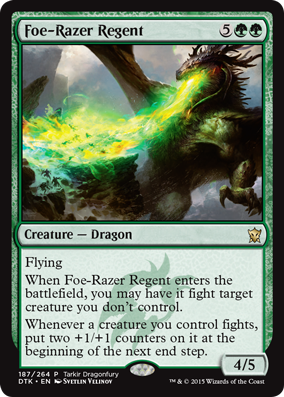 As a member of the green-white Dromoka, you'll be able to play plenty of creatures—and then beef them up with the returning bolster mechanic from Fate Reforged. Ally yourself with Dromoka, and send your legions to roll over your enemies! 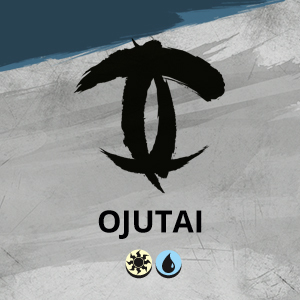 Followers of the white-blue Ojutai like to play a tempo game and use spells to their advantage. Many Ojutai spells have the mechanic rebound, which means you'll get the spell's effect twice! Whether a powerhouse sorcery or a simple instant to help your creature win in combat, you'll get double use out of your spells! If you like soaring through the air and using spells to cleverly beat past your opponent's creatures, Ojutai is the dragon for you! Silumgar is ruthless—and those who follow him are just as crafty. 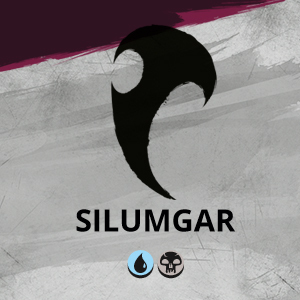 The blue-black Silumgar cards are tricky and versatile, partially thanks to the brand-new exploit ability! Exploit creatures let you sacrifice creatures—themselves included!—for an additional effect. Have a creature with a "when this dies…" trigger or something small you don't need anymore? Sacrifice it for the greater glory of Silumgar! If you like versatility and aren't afraid to sacrifice some of your own creatures, give Silumgar your devotion! Fast. Brutal. Efficient. Kolaghan's black-red army hits hard and seeks to end the game quickly. 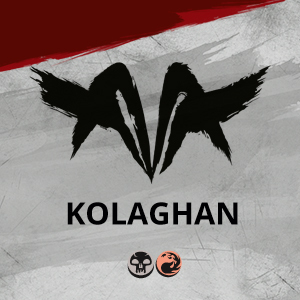 Kolaghan harnesses the same ability we saw in Fate Reforged: dash! Thanks to dash, your creatures can come down even faster, and with haste, to deal damage even quicker. If you want to be aggressive and quickly slay your enemies, Kolaghan will be right up your dragon-laden alley. In a world full of big dragons, the red-green Atarka wants you to have some of the overall beefiest board states. The new formidable mechanic means your creatures get better when you have at least 8 power on the battlefield. So whether you want to have a couple big creatures or a smaller army, Atarka is interested in your service. 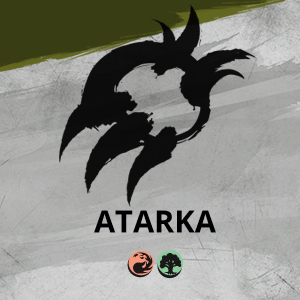 If you like smashing with big creatures and the thrill of trying to get 8 points of power onto the board, choose Atarka! All right! So you've chosen the two-color dragon you want to align with! Now it's time to kick everything off! You'll go to your store, choose your clan (or, if you preregistered, perhaps you already chose when you did that), be handed a clan box, and it's off to the races! Inside this box you'll find a lot of neat things. But most key to your day are going to be the six booster packs that will give you the cards you need to build your Sealed Deck (four Dragons of Tarkir, one Fate Reforged, and one special booster full of cards to help you play your colors). First, rip those packs open! If you want to add some fun sound effects (sound effects make everything better), feel free to pretend to breathe fire on them. Then, you'll have a stack of cards. It's time to build your deck, of course! Sealed Deck is a little different from normal deck building. You get to build a deck only out of the cards in front of you, plus as many basic lands as you'd like. Also, unlike a normal Constructed deck where the minimum deck size is 60, you only have to play 40 cards. Deck building in Sealed can be tricky—and this is where that special booster comes in! When you picked your box you chose a dragonlord, and that dragonlord matches up with the contents of your special "seed booster" that was wrapped in plastic as you opened your box. This "seeded deck" experience helps you figure out what colors to play. That pack contains cards only in your chosen dragonlord's colors—meaning that's a pretty safe bet for easily making your deck as those two colors. While you are allowed to play any colors you want, most often it's going to be advantageous to play the colors of your dragonlord. So, what I would recommend is to just set aside all of the cards of the other colors and pick the best cards out of those two colors. If there's a really cool rare or strong card in another color you want to play, set it aside and come back to it later—since you could consider "splashing" it if you have the right mana-fixing—but in general you'll want to put away cards of other colors here. All right, so how do you narrow down all of your cards down to the 22–23 cards you're going to want to put in your deck? It's time to lay them out! That's far from hard and fast, but it's a good place to start. Cull your creatures down to these numbers by choosing your favorites. 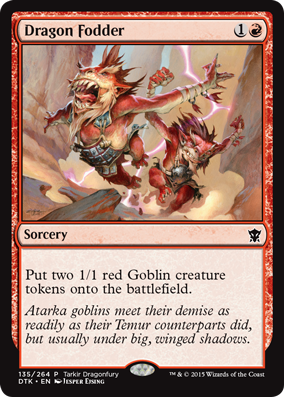 Keep in mind that any megamorphs you have can also be played for three mana, so often you'll be able to play fewer cards that cost three to help compensate for that curve! Now that you have your core creature base figured out, it's time to add in spells! Pick your favorites from among your colors to bring your deck to 22 or 23 cards, and then you're good to go from the spell side! The last thing to figure out is your mana base! While two colors is what I would generally try to play in Dragons of Tarkir, sometimes you will end up in three thanks to some Fate Reforged mana fixing and some Dragons of Tarkir Monuments. So, especially if you're playing three colors, making sure you can cast your spells is important. I would definitely play all of your nonbasic lands that produce mana of your colors. Even if they enter the battlefield tapped, it is a small price to pay for making sure you can play your cards on time. You'll want to play more lands producing mana of the colors of less-expensive cards in your deck than of the cards with the more expensive mana costs to ensure you can play your cheap cards on time. You can play more than 40 cards, but you really should stick to 40 if you can. Every card over 40 you play just means it's that much less likely you're going to draw that awesome rare you put in your deck! The land ratio you're looking at should be about 17 lands to 23 nonlands. This isn't right 100% of the time, but most Limited decks end up looking like this and, in general, it's what I would want to have. Play a mix of cheap-to-cast and expensive-to-cast cards. If you have all cheap, small creatures, then a single big creature can shut you down, but if you have all expensive, large creatures you risk getting run over first. Stick to a mix that focuses on the two-, three-, four-, and five-casting cost creatures. More games of Sealed Deck are won by casting a creature every turn starting on turn two or three than any other way. Evasion is important! Often, Sealed Deck games will get into stalls where both players have a lot of creatures and neither player can attack very well. Creatures with abilities like flying ensure that you can break through these creature stalls. "How I Break Down My Sealed Pool"
Some stores also support a version of Sealed Deck called Two-Headed Giant (often abbreviated "2HG"), where two players team up against other pairs of players. Each pair gets two Prerelease Packs (they don't have to be the same clans, even; you can figure out which two clans go well together—or double up on the same clan!) from which the players build their decks. Your tournament organizer can tell you more about 2HG if your store supports it. 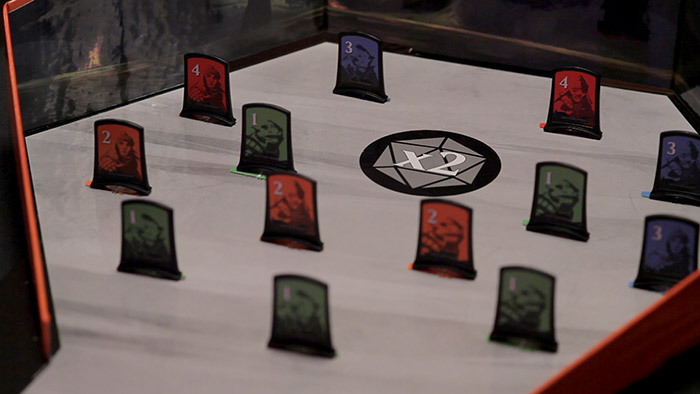 If the idea of spending a day playing a tournament scares you, or you just want to experience more games with Dragons of Tarkir, you can get involved in Open Dueling. In this side event, you get a ready-to-play 60-card Intro Pack and use it to do battle against others participating in Open Dueling, including players participating in the main tournament who are between rounds! This is a great way to dip your toe into the water if you aren't sure the Prerelease is something you want to do, or if you can't commit five hours to a Prerelease event, you can just play games in Open Dueling at your own leisure. Plus, it's fun! In addition to all of those cool regular cards in your packs (and hopefully some Dragons!) inside your box, you received a couple other cool things as well! The first is your Prerelease promo card. You can play with this in your deck—and there's a good chance you'll want to—so be sure to put it in your deck-building stack! Each one is themed to the breath weapon of that box's dragonlord. For example, Kolaghan's is lightning themed since she spits out lightning! These will be something definitely worth trying to collect, so don't accidentally leave yours at your table. You can use them for raining fire down on Tarkir! It's time to be a dragon and try and destroy as many as possible! Here's how it works. You'll get to go up to this board and assess it. Try and figure out the best angle of attack. And, then, you roll your special Spindown™ life counter you got in your Prerelease box (Remember how it's themed as a breath weapon? Well, here's your chance to use your breath weapon!) and try and knock down as many as pieces as possible. Each piece has a point value on it. You get points equal to the total number you knocked down. But there's also a little bonus. See that circle in the top-middle? If your dice ends up in there, you'll double your score! If you can aim just right, you'll rack up a massive score. Looks like it's time to break out the rulers and talk to your friends who are good at physics to figure out the best way to try and roll at this! But, of course, not all of us have that kind of patience. So you get two total rolls. Whichever one you get a higher score on, write down on the nearby score sheet! That's the leaderboard. Try and get the most points out of anybody in your store! Oh, and did I mention there are special promo card prizes? If you knock down at least 3 points' worth of figures, you'll earn a promo! Here's what you can earn. Knock down 3 points? 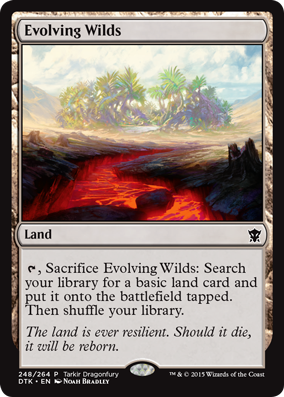 Well, how about an Evolving Wilds! Finish off 9 points' worth of foes? Have a Dragon Fodder, plus that Evolving Wilds! If you can knock down 12 points worth, not only will you get that Dragon Fodder and Evolving Wilds, but you'll also snag an Dragonlord's Servant! And, if you're bad enough to score a whopping 18 points, you'll earn all three of the other cards…and the rare Foe-Razer Regent. So, in short: you get to roll your Spindown™ breath weapon twice at any point between rounds, then score some nice promos based on how many points you get. Free stuff and getting to be a dragon? Count me in! Magic has really never done anything quite like this Tarkir Dragonfury activity, so get out there and check it out! Let's see just how powerful of a dragon you are. There's a lot happening in Dragons of Tarkir! I briefly talked about the five mechanics for each of the dragonlords, and that's not even beginning to touch on megamorph! You'll also be hopping into your TARDIS and doing a little bit of traveling back to Fate Reforged at this Prerelease, and there are plenty of other abilities present from that set as well. Bolster hasn't changed since its appearance in Fate Reforged. To bolster, first find the creature you control with the least toughness. If there's a tie, choose one of those creatures. Then put a number of +1/+1 counters on that creature equal to the bolster number. Rebound is making its return after originally appearing in Rise of the Eldrazi. How it works hasn't changed. Rebound lets you cast an instant or sorcery spell a second time for free. If you cast a spell with rebound from your hand, you exile it instead of putting it into your graveyard. Then, at the beginning of your next upkeep, you can cast the spell again without paying its mana cost. After casting it from exile, it's put into your graveyard. Exploit is a new ability. When a creature with exploit enters the battlefield, you may sacrifice a creature you control. Each creature with exploit has another ability that gives you a benefit when it "exploits a creature." This means when you sacrifice a creature because of its exploit ability. That ability doesn't trigger if you sacrifice a creature for any other reason, including the exploit ability of a different creature. Dash hasn't changed since its appearance in Fate Reforged. 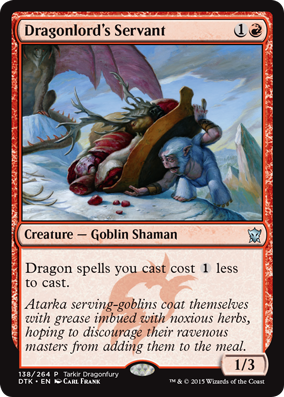 Dash is an alternative cost found on creature spells. As you cast a spell with dash, you can pay its dash cost instead of paying its mana cost. If you do, the creature will have haste, so it can attack that turn. At the beginning of the next end step, you'll return the creature from the battlefield to its owner's hand. Formidable is an ability word, so every formidable ability is different, but they all care in some way about controlling creatures with total power 8 or greater. When calculating the total power of creatures you control, use their actual powers, even if they're less than 0. If you understand how morph works, megamorph is almost exactly the same. The only difference is that if you turn a face-down creature with megamorph face up, not only will it suddenly have its normal characteristics, but you'll put a +1/+1 counter on it as well! When you manifest a card, you put it onto the battlefield face down. While face down, it's a 2/2 colorless creature with no name, no abilities, and no creature types. Face-down creatures are creatures in every way. Any time you have priority, you can turn a manifested creature face up if it's a creature card. You do this by revealing what its mana cost is and paying that cost. This also lets your opponents see that it's a creature card. As soon as the card is face up, it has its normal characteristics. If you manifest a noncreature card, it can't be turned face up this way. If you happen to manifest a card with morph, you can turn it face up either by paying its mana cost (if it's a creature card) or by paying its morph cost. Several cards in the Fate Reforged set have abilities that include hybrid mana symbols. A hybrid mana symbol can be paid with either of two colors of mana. If a cost includes multiple hybrid mana symbols, you can choose a different color to pay for each. Dragons of Tarkir is a whole new format compared to anything else in Tarkir block. With a suite of new mechanics, a host of Dragons, and a two-color focus, you'll be seeing the same plane—but with an exciting new world of possibilities. I hope you all have a blast going out to a Prerelease, battling for your dragonlord and launching your breath weapons at citizens of Tarkir. Oh, and if you'd like to go check out the many awesome cards you could open in the set, don't miss the full Card Image Gallery—it has all of the cards in the set, in all of its dragony goodness. If you have any questions at all about the Prerelease or what you should expect, feel free to send a tweet my way or ask me a question on my Tumblr and I'll be sure to take a look and help you out as much as I can! Have fun this weekend. It's time to close out the world of Tarkir with a wonderful, fiery bang!